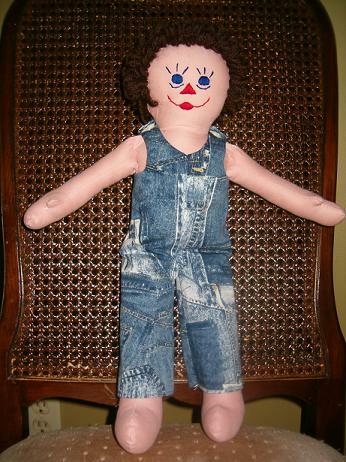 In this article we will make overalls for our 15 inch Annie Doll and meet her brother Andrew. As you have seen in my previous articles about Annie, I kept her hair rather short. This way, if you dress her in boy's clothes she becomes Andrew! 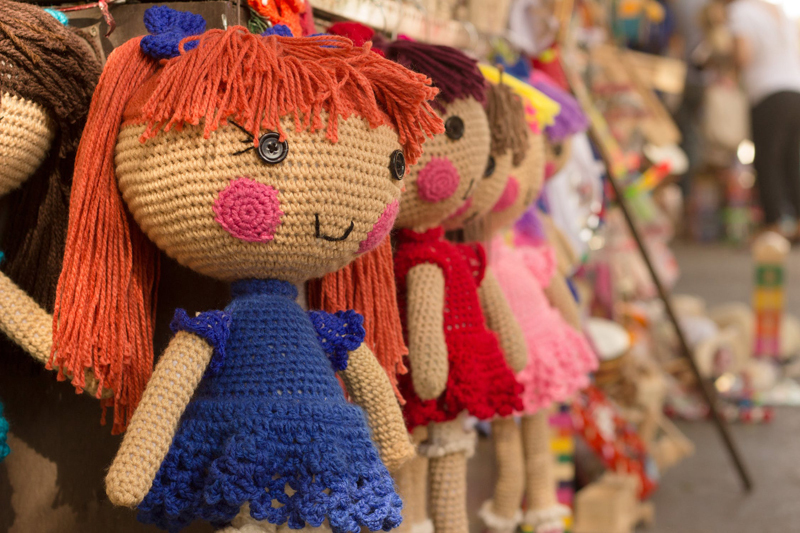 This is for all of you who love Raggedy Ann and Raggedy Andy type dolls. To see Annie look here. This is a very simple pair of overalls, very easy to make. You can add your own individual touches because they are so simple. To make them for Annie you could make them in pink corduroy and add lace to the hems; or add a pretty ribbon bow. To make them for Andrew, as I have, I suggest a fabric that looks like denim, or denim patchwork, as I have used in the picture. 1/2 yard of fabric of your choice, I suggest a little heavier fabric than calico, muslin would work well. 2 small buttons to put on the back shoulder (so it looks like they button closed). This is optional, if the doll is intended for an infant or toddler leave off the button as it could be a choking hazard. All pattern pieces include a 1/4 inch seam allowance. The pattern is shown on a 1/2 inch grid. If you are printing the pattern out, enlarge it until the squares in the grid shown equal 1/2 inch. To begin, hem the bottoms of the facings, cut them with pinking shears or over sew the edges with a serger, to keep them from raveling. Pin and stitch the facings to the overalls around the armholes, neck opening and shoulder tabs, with right sides facing. Do not sew the center seams yet! Clip all the corners and curves. Now sew the center seams from the bottom of the facings to the bottom of the center front and back seams; also with right sides facing each other. 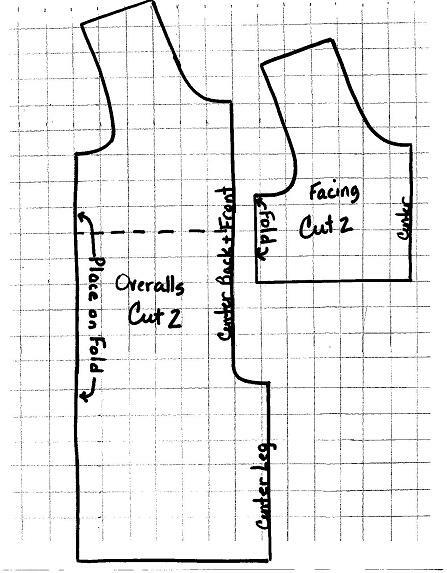 With the overalls inside out sew the leg seam, matching the center seams at the crotch. Hem the bottoms of the legs. On the top of the front shoulder tabs, and the under side of the back shoulder tabs, attach the hook and loop dots so they line up and close the shoulders. Sew a button on the top side of the back shoulder tabs, directly above the closure dots. The shirt for the 21 inch David Doll can be worn with these overalls, if you wish. The pattern and instructions can be found here.